Last night we enjoyed a film sponsored by Community Cinema (click here for more) which inspired two-thirds of the audience to remain after the film and fold paper into inspiration. "When you look at a piece of paper, what do you see? If your answer is a flat, two–dimensional square, then Between The Folds will astound you. Blurring the mysterious lines between art, science, sculpture and math, the film is an exhilarating adventure into origami, or paperfolding, featuring works of art whose emotional expressiveness and engineering complexity defy logic. Just as Michelangelo might have seen a statue standing frozen inside a block of marble, the eccentric artists and scientists in BETWEEN THE FOLDS envision the three–dimensional possibilities of paper, and, as if by alchemy, change the mundane into the poetic and magical—all with no scissors, no tape and no glue. Ultimately, the medium of paperfolding itself—a blank, uncut square—emerges as a resounding metaphor for the creative potential of us all." 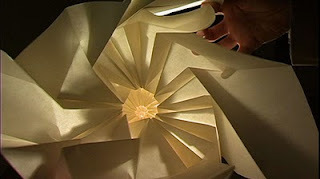 I've loved folding Origami since The Sisters were babies, it magically relaxes me. Just about every morning I wake and fold while my coffee brews-- a slow, creative wake up and it helps my fingers warm up for the day. Since we are all about books here The Origami Handbook by Rick Beech is my favorite these days, it is in its third edition, if that is any test of a book's merit! 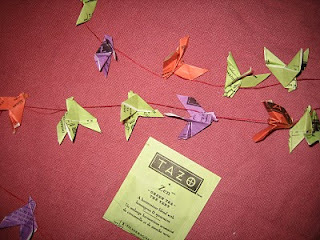 For a little more folding inspiration --how about tea wrapper peace doves? Drink tea, fold origami, very zen (pun intended). Have you taken a Challenge? Start Here. We'd love to read what you are thinking. The movie is magical-science-art-brilliant. The Movie is available on Netflix. It is only one hour long and worth every minute! My husband Bryan and I decided we were compatible when we discovered that we both liked to crochet and we both liked to do origami. Bryan makes bunnies out of paper napkin rings at restaurants to entertain the kids or impress the waiter. One year we decorated our entire Christmas tree with folded paper animals and made 40 or so origami ornaments to give as gifts (yes, we did experience some serious hand cramps). There is something so relaxing about having your hands busy with intricate folding and letting your sub-conscious mind float free. We have to see this movie!